The Women’s Liberation Movement of the 1960s and 1970s fought for women to have the right to have it all–marriage, family and a career. Television had such role models as Mary Richards, Rhoda Morgenstern, That Girl, Murphy Brown and the Designing Women. 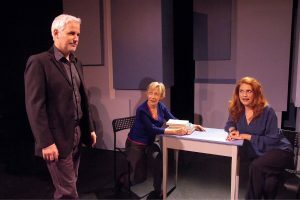 Grace, the central character of Sharon Sharth’s Waiting for Grace, receiving its World Premiere as a guest production at the Odyssey Theatre, counts Mary Tyler Moore’s character as a role model. But did those pioneers really have it all? Mary Richards wanted to get married but never did. Rhoda got married and quickly then divorced when the ratings crash dived. Murphy Brown had a baby but no husband and drew the wrath of Vice President Dan Quayle. Sharth’s Grace, an actress in her late thirties, has always put her career before marriage but her biological clock is winding down. She’s been with her current boyfriend for seven years but when she corners him on marriage, he admits he loves her but doesn’t like her and leaves her. Grace then starts a mad spiral of dating and relationships of varying lengths, egged on by her therapist and later her Relationship Coach. Time is running out quickly and a move from New York to Los Angeles hasn’t helped in finding a husband. But then along comes David, a successful entrepreneur, divorced with a 30 year old son. He seems a perfect match for Grace who even says he want to marry her after only dating a few weeks. Then business failures start to put a strain on the wedding plans and the relationship is even more strained by Grace’s desire to finally have a child. At her age the chances of conceiving are 2% they are told but the couple goes through several rounds at the fertility clinic. Will Grace ever get to wear that wedding dress her mother has longed to see her in? Sharth’s play covers a lot of familiar feminist ground and contrary to the play’s hype her views aren’t that controversial or new. Wendy Wasserstein wrote the definitive “having it all” play The Heidi Chronicles in 1988. Sharth’s play seems very personal but it feels like a one-woman show that suffered growing pains. It actually might work better as a solo show, cut down to half its current two hours. It would eliminate some of the repetitiousness. It has been given a strong, solid production under the direction of Lee Costello. Sharth plays Grace and is never absent from the stage and she does hold your interest. The character seems to suffer from aphasia (better done and with a lot more laughs by Christopher Durang in Beyond Therapy) but it’s never fully explained and doesn’t really provide the intended laughs here. Todd Babcock offers strong support as David; he really does seem like the perfect man even when his life starts to implode. Pamela Dunlap does deliver the laughs as Grace’s no-nonsense Mom and as the Coach with really great relationship advice (Paid or Laid?). Jeff LeBeau provides the needed variation in all of the other men in Grace’s dating life. Lily Knight and Bob Telford play a variety of characters.